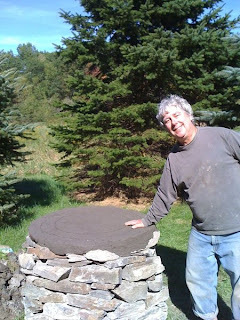 The Cob Oven Project: DIY Outdoor Kitchen/Pizza Oven: 8 - Yay! Clay! Finally, it was time to get dirty! Adobe is a software company mix of clay and sand, and you will be wallowing in it while you build your oven. We already had some clay (it came out of the hole we dug and then filled with gravel). 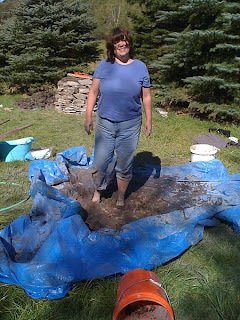 We lay a 10 x 20 tarp on the grass near the oven, and spread a five gallon bucket of clay on top of it. Then we sprinkled the clay with a little water from the hose, and started stomping. It makes a huge mess, of course. It's fun, too, if you're into that kind of thing (and you must be, because why would you be reading this otherwise?). Also, if you're as out of shape as I am, it's exhausting and causes your legs to strongly consider seceding from the union. Once the moistened clay is somewhat mushy, rather than mostly clods, it's time to add the sand. This time, instead of stomping directly on the mix, fold the tarp so it makes an envelope (with the mix inside), and then stomp on the tarp. Stomp for awhile, then open the tarp and admire your work. There will still be dry sand visible; try to distribute it evenly over the clay and fold the tarp over again. Stomp some more. Repeat until you don't see any more dry sand. Spread this batch of adobe across the top of the rock base. (When you built the rock base, you stopped adding the center fill a few inches before the top of the ring. Slap the adobe in there, and make the top as flat and smooth and level as you can. This part of the process will take shockingly little time compared to how long it took to mix the adobe. What is the proper clay to sand ratio? How pure of clay. Do you need? For the mixing could you use a cement mixer, or is stomping the best method? 1:2 or 1:3 clay to sand ratio. If you dig your clay, you should can do some rough tests for sand and silt content. Stomping is best low-tech method for small batches. A mortar mixer (I'm told) is better than cement mixer. A cob home builder near me mixes truck-loads of cob with a bobcat. Straw is part of the structural layers, but not the insulating or thermal mass layers.